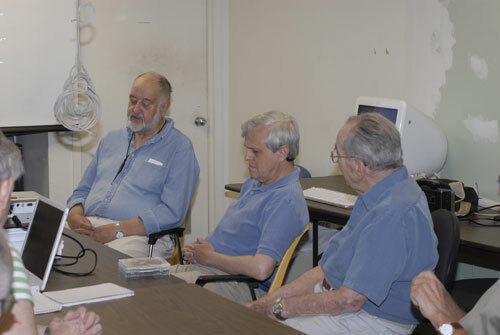 On May 24, at the Rockville Clubhouse, nine Pi members and two visitors (who came for the first time and later joined!) shared their interests, in order to plan future meetings. May was apparently Blue Shirt Month. Photo by Richard Sanderson, taken with a Nikon D-200 digital camera. 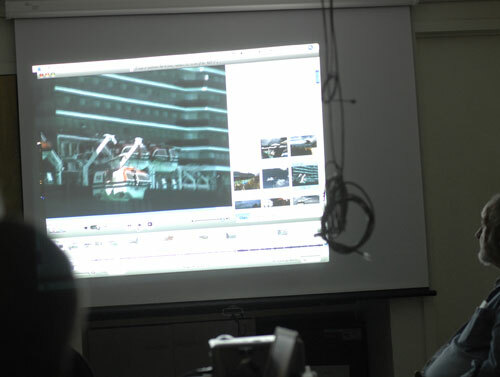 Len Adler showed an iDVD project he is working on, including some issues he has yet to resolve about the use of mapping. This involves incorporating digital still photos into what the viewer sees early in the movie. 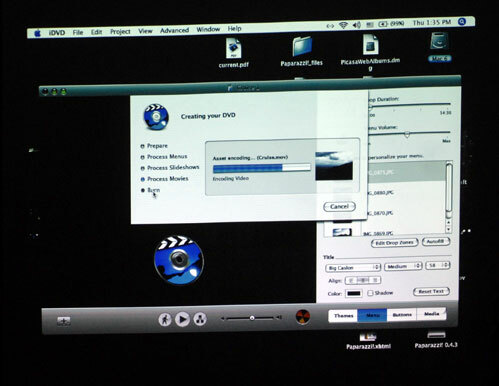 Making movies with iMovie. Photo by Richard Sanderson, taken with a Nikon D-200 digital camera. Since many will be traveling over the summer, our next meeting will be in September, with a new SIG member, Lew Norman, presenting Adobe's new Photoshop Lightroom. Many Pi members present have so many photos on their drives that finding one easily is now challenging. Lew hopes his experience with Lightroom will show how to readily categorize and retrieve pictures. Clearly, digital photography and movie production are hot topics. Compressing data with iDVD. Photo by Richard Sanderson, taken with a Nikon D-200 digital camera. Our next meeting will be Sept. 27 at 1:00 p.m. at the Pi’s Rockville office.